PakScan is a non-destructive multi-product leak detection device for pouches, sachets, small medical devices and other flexible packs. Non-destructive multi-product leak testing for pouches, sachets, small medical devices and other flexible packs (non-porus materials) which contain dry powder or a solid component. A touch screen user interface monitors the PakScan progress through a virtual insturment panel.. Tested samples can be replaced in the packaging line as they are not damaged during the test process. This test is clean and dry, unlike the Methylene Blue Dye method, therefore PakScan generates less waste and reduces associated waste disposal costs. 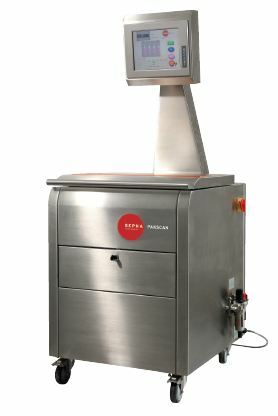 PakScan inspects up to 4 large sachets simultaneously, each pack measuring up to 275mm x 90mm x 50mm. This speeds up testing and offers a more representative view of the entire production web. The machine can be customised for smaller or larger format areas or to accommodate users’ specific sample size requirements. PakScan identifies leaks in individual packs as small as 10μm, depending on the pack size and format. The system can also be pre-programmed at the same rejection levels as the Blue Dye Test, if required. PakScan test results are generated automatically based on the pre-programmed test method used for each pack. As operator subjectivity is removed, the system can be validated. Complete GMP or GAMP validation documents are available. Intact pouches show a green ‘Pass’ result and leaking pouches show a red ‘Fail’ result. Drug stability testing in laboratories - R&D departments test materials to ensure the correct materials are used to protect new products from contamination by moisture, air and bacteria. QA Testing of packaging processes - Build leak tests into the Quality Assurance procedures for your packaging line. Objective seal testing ensures the integrity of the packaging process. Reduce production rejects - Minimise reject pouches and sachets and waste disposal created in pharmaceutical production and packaging facilities by carrying out leak testing more frequently. Earlier detection of a leak means line operators can troubleshoot the cause of a leak before a large volume of faulty packages are produced.